I have a love-hate relationship with packing. I love the excitement that comes with shoving all your stuff into a bag, imagining what your fabulous upcoming trip is going to be like, and how you’re going to use each and every one of the meticulously selected items. But I hate the fact that it’s so hard to tell what you will actually use until you’re halfway around the world, likely weighed down by pounds and pounds of things you don’t need and missing at least one necessary item that you can’t believe you forgot. But more than anything, I hate having a bag full of junk in an airport or a train station, having to dig around through a million things to find your passport, fiddling with straps that are too short or a bag that (literally) rubs you the wrong way, all while trying to get your shoes on and off and wondering if anyone is ever going to see the full x-ray photo of your body that was just snapped by that TSA machine. A well-packed bag can make the difference between a relaxing, easy airport experience and an absolutely horrible one. My favorite personal example of the horrible carry-on-effect was the day that I was trapped in Madrid Barajas airport for 27 hours due to an unexpected holiday season snowstorm. Upon arriving at the airport I found out that my single checked bag was drastically overweight and I ended up having to check the backpack I was using as a carry on to redistribute. As a result, I had to use a re-usable polyester shopping bag as my carry-on (great bag, just better used at the market! ), I accidentally checked my iPod (which, as an extra slap in the face was later stolen out of my suitcase), my cell phone ran out of batteries (charger, again, in checked bag), and I had LITERALLY 2 (euro) cents left in my checking account. I ended up in tears, alone, sleeping in a luggage cart after fruitlessly waiting for ten hours in a line to get on a new Iberia flight, and very, very hungry. Eventually I got back home (about 42 hours later), ate, and recovered most of my possessions, but I will ALWAYS pack and prepare more carefully as a result of that trip. Sometimes, if you’re lucky, you won’t have to check a bag at all. But if you do have to check a bag, or if you just want the convenience of not having to lug all of your belongings through the airport, you’ll have to bring something with you on the plane. The above is a typical carry-on for me when I am traveling long-haul to an urban destination (let’s be honest–a trip to Berlin required slightly more frivolous packing than schlepping through Albania or exploring Costa Rica did) with a checked bag. I would pack very differently on a domestic flight or on a flight where I have everything in the cabin with me. 1. Medium-sized bag: Not too big that it can’t be used as a carryall-style purse later in your trip, but not too small that it can’t hold all the essentials. For my last trip I used the Baggallini Only Tote which was affectionately nicknamed “the diaper bag” by my traveling companions, because that is exactly what it looks like. I am still deciding how I feel about this bag…on the upside, it’s super lightweight and can fold up pretty well if it needs to be packed, it’s shallow so you can easily see what’s inside and get to it, and it has incredibly convenient pockets. It also holds a lot of stuff, including my DSLR. On the downside, it tends to get a little too wide when it’s fully packed to be held comfortably on your shoulder, and, well, it looks like a diaper bag. I’ll go into more detail in a later post, but the point is, bring a bag that can hold what you need, make sure that it’s comfortable enough to carry around on the plane and once you’ve hit the ground, and make sure you can easily get to the things inside. In the future, I’d like to upgrade to something a little less diaper-baggy, something like this beauty, though leather can be heavy and I would hate to get that thing dirty! I also try to bring a small purse with me inside the bigger bag (way smaller than the one pictured, which is what I carry daily). For me, this eliminates the frustration of juggling two bags and the difficulty of digging through a bigger bag to find my documents at the airport, as well as keeping all my most valuable items contained in one easy to access place. Once I land, I then have the option of carrying the big bag, for days when I want to take my DSLR with me, or the little bag, when I need less stuff. 2. Phone/Music Player: I have an HTC Evo 3D which is great because it has the ability to be phone, music player, ereader, translator, camera, etc. etc. etc. all in one. Basically, travel with a smartphone! It’s great. If you don’t have a smartphone, an iPod Touch is a fabulous and totally under-rated travel tool. I used mine to death living in Spain, and I highly recommend it if you don’t want a smartphone or a phone contract. I also use Spotify premium and LOVE it. You can take playlists with you offline, and I think it’s totally worth the $10/month to have unlimited access to music (including a lot of international music) anywhere you go. I have yet to find a reliable way to access Google maps offline, but maps in general on the iPod Touch/Smartphones are a lifesaver and much less conspicuous than a big paper one, though in some places it might be better to wave a paper map around conspicuously than an expensive electronic device…your call. 3. Kindle and charger: I love my Kindle! Before I got one, I read a lot of public domain books on my iPod Touch which is super compact and great for those of you with good, young eyes, but most people find the tiny LCD screen irritating. The Kindle on the other hand, is truly easy on the eyes. Now they’re even smaller (and cheaper) than ever, and with access to tons of free ebooks through the library, I love reading again. If you have the version with 3g you also have the added bonus of free internet access around the world. Not many people realize that, but you can use the 3g to actually go online, check your email, etc. It’s not perfect and it’s a bit of a pain to type, but it’s great in a bind or if you’re unable to travel with a cell phone. And did I mention it’s free??? Instapaper is another great tool that allows you to clip online content to a kindle-friendly offline format. I use it to clip articles about my destination for plane reading. The charger also works with my phone, which means one less cord to pack! 4. A snack and an empty water bottle: You should definitely keep TSA in mind with this category, but it’s always a good idea to bring snacks on the plane and usually they don’t have a problem getting through security. Airport food is gross, expensive, and unhealthy and typically makes me feel horrible, and many airlines no longer offer any food at all, even on the longest of domestic flights. On my last trip, my friend and I brought cheese and crackers, carrots and hummus, and some homemade brownies that in total only cost us each a few bucks and lasted us from SFO to YYZ. It was a bit weird that the hummus wasn’t confiscated, but it was only a $2 investment and was well worth the risk! I also bring a small (empty) nalgene bottle and ask the flight attendants to fill it with water every time they go by to keep hydrated en route. It makes for a much more pleasant journey, and you end up with a little extra space in your bag once you’ve devoured everything. 5. Socks: I like to wear ballet flats because they are compact, dress up or down well, and are easy to deal with at security, but once you’re on the plane, they can be less than snuggly and your feet can get cold. I pack one pair of wool socks that I slip on once we’re in the air. It makes me feel a bit comfier and keeps the airplane chill away. 6. Toiletries: I bring a little mesh bag of a few select toiletries with me that will last me through my journey and will hold me over if my checked bag does not survive the trip. Toothbrush and toothpaste, a baby GoToob filled with facewash, travel-sized deodorant and face/body lotion, nail clippers, tweezers, and only the most essential of make-up supplies: powder, blush, mascara, and chapstick. If I am stranded without all the other stuff, I will survive very comfortably with those things. Never underestimate the usefulness of nail clippers and tweezers when you’re traveling; I literally never go on a trip without them! 7. Pashmina: It’s a scarf! It’s a blanket! It can protect your hairdo from drizzle! It can make you decent enough to enter a Catholic church/temple/other place of worship when you have no sleeves! It can cover that nasty armrest you want to lay your head on at the airport! You can sit on it on the beach! So many uses for a $5 purchase. Pashminas, I love you. 8. Passport-friendly wallet: I don’t like having my passport and my wallet separate from each other. Some people like to spread things out so they don’t lose everything if they get pick-pocketed, others like to go for the money belt. I’ve tried both. I don’t like them. I prefer to have one place where I keep cards, cash, and passport, and I protect it with my life. I found a wallet at Forever21, of all places, that is perfect for this. It’s exactly passport sized, clips shut so nothing falls out, and is still slim enough to carry daily. I’ve also used it every single day for three years, and it hasn’t malfunctioned yet. And it was $6! Woo! 9. Breathmints: Chances are you will be sleeping and/or eating if you’re traveling for more than like 6 hours, and you can’t always break out the full toothbrush, so these are mandatory. 10. Camera: This is just one of those items that I’m never putting in my checked bag. Camera bags do not work for me, so instead I keep my Canon Rebel in a neoprene sleeve that costs….wait for it….$5. And then I pop it in my carry-on. It’s about as compact as you can get, and while the sleeve won’t protect it from everything, it’s a pretty good safeguard from normal bumps and scratches. So that’s it! It’s not the shortest list in the world, but when I’m going to Berlin, or London, or Barcelona, I’m not exactly in survival mode. I’ll save my survival-mode packing instructions for another post. Packing light doesn’t have to mean being uncomfortable or ill-prepared, and if you do it right, you can make it anywhere in the world while staying pretty, comfy, and entertained! Normally when I go on a trip, packing is easy. Or at least that is the way it’s always been for me in the past. Twice I’ve utilized my enormous rolling suitcase (like 50-70lbs when fully packed enormous) for trips lasting over four months where I knew I’d be staying in one place. Once I even used that same enormous suitcase for a two week trip that didn’t involve much moving around. Other times, I’ve packed my backpack with the essentials for my destination of choice and the appropriate season. Summer in Albania was easy: It would be hot and dry and I packed super light. Spring in Costa Rica was also a piece of cake: nothing fancy, just bathing suits, shorts, and tennis shoes for muggy, hot outdoorsy-ness. I never really needed to pack super tight because I always knew what was in store. But packing for my last trip (to Germany and Denmark in the fall) was a different story. I was traveling for only about ten days, but the weather was all over the place: 50 degrees one day, 80 the next. Raining, then blazing sun. On top of that, it was an urban trip and I wanted to look presentable: no dirty tank tops and flip flops on this trip (well, not at the beginning of the trip at least!). Packing light is nice, but there were pictures to be taken people! I also knew that I wanted to take my backpack (no more pulling rolling suitcases up metro stairs for me! ), but was concerned about having to get in and out of a top-loading pack when I knew it would be absolutely crammed with stuff, not to mention fitting it all in there in the first place! Enter the completely unexpected solution to my packing problem: the Pack-it Folder. I had been looking around at a variety of websites and travel blogs where people go into rather crazy detail about their packing habits and preferences, and this weird little envelope just kept popping up. The idea of folding all my clothes into one pile didn’t seem like the logical solution to my problem. I was skeptical, but I decided to give it a try. The Eagle Creek brand of these packing folders (there are others by Magellan and similar companies too) is available lots of places, including REI and the Container Store. The idea is that you use the plastic insert as a guide to fold up your clothes and then you stack the folded items into the envelope, folding the whole package together with velcro closures. It seems to be designed with men’s collared shirts in mind, but I found that it works even better for casual women’s clothes since they tend to be smaller and less finicky to fold. I gave up on using the folding board after my first use because I realized that I could fold my clothes in any way i liked and still get a LOT of stuff into this folder. The label says 8-12 shirts, but I found that its optimal capacity was more like: 5 women’s tank tops, 5 cardigans, 1 pair jeans, 1 pair black pants, 3 blouses, 2 dresses, 2 pairs shorts, 1 pair pajamas….basically everything but thick sweaters and jackets will fit surprisingly nicely. Once your clothes are in, you place the plastic folding insert back on top and velcro it all up like an envelope. It seals up pretty tight, so things stay in place and don’t shift around too much (I found that when it’s super packed things do shift a bit, but far less than they would loose in your bag!). I have the 18-inch model, which slides snugly into my Osprey Exos but might be too tight for bags even a little bit smaller. It doesn’t fit into my smaller North Face Recon or my Baggallini Only tote at all. When you need to access your packed clothes, you simply pull out the whole folder and peel off the layer you need, replacing the rest. Clothes stay as neatly folded and wrinkle-free as you’d expect them to be in a well-filled drawer in your house. The whole process is much easier than pulling out everything each time you need to get to those socks at the bottom of your pack, and less frustrated than pulling out a bunch of small vacuum or compression bags and trying to remember which item is in which bag. I even managed to add a new purchase, my Oktoberfest dirndl from C&A, into the envelope, which I totally thought was at capacity when I departed California. 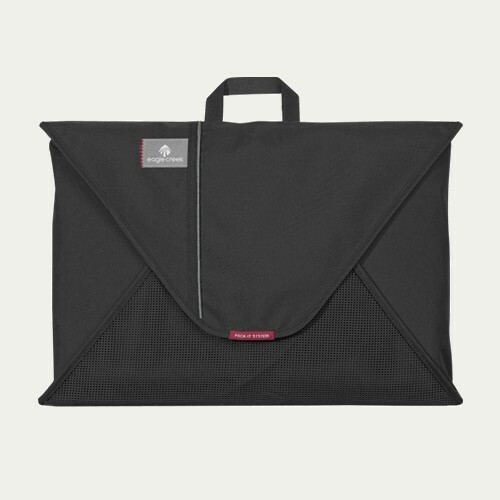 All in all, this envelope is awesome for both for urban backpacking as well as singe-destination trips where you want more room in your suitcase or are just trying to stay wrinkle free. This folder won’t fit everything; I mentioned jackets before but bras, socks, etc are also not going to fit into this thing with any kind of efficiency, so little mesh zipper bags are a great addition to this method of packing. I get mine for $1.50 at Daiso in San Francisco, but you can probably get them at any dollar store, or travel stores if you want to pay more.